Michigan’s approximately 20 million acres of forest land play a key role in the state's recreation, forest products and other important industries, and the health of those forests is essential to sustaining this vital resource for many generations. 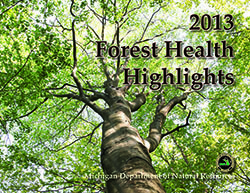 The Department of Natural Resources (DNR) has released its 2013 Forest Health Highlights report, an overview of Michigan’s forests, the insects and diseases that have threatened them over the past year, and details about what DNR staff is doing to improve forest resources. The report breaks down forest health threats by examining insects and diseases, forest decline, invasive plant control and other health concerns. Accompanying photos and maps illustrate the pests and show the effects they have had on Michigan’s forest system. Highlighted in the report are DNR’s efforts to control oak wilt, a serious disease that threatens Michigan’s extensive red oak resource. In cooperation with the U.S. Forest Service, tens of thousands of feet of root graft barriers have been installed on state forest land. These barriers prevent oak wilt from moving to healthy trees through infected root systems. To learn more about the health of the state forest, check out the 2013 Forest Health Highlights report by visiting www.michigan.gov/foresthealth. Learn to snowshoe or cross country ski at a state park near you. Visit www.michigan.gov/dnrcalendar for event listings.